82,000/-. The SBP Pakistan is offering great opportunity of jobs for fresh graduates in Pakistan. The State Bank of Pakistan jobs every year bring SBP Young Professionals Induction Program (YPIP) for young graduates to start their career in banking. SBP Banking Services Corporation (SBP BSC) was established in 2001 as a wholly owned subsidiary of State Bank of Pakistan. As an operational arm of State Bank, SBP BSC is engaged in managing currency and foreign exchange operations; providing banking services to the government, financial institutions and general public; conducting development finance activities; implementing export refinance and other government subsidy schemes; performing agency functions like sale/purchase of prize bonds, prize money draws, national saving instruments schemes etc. SBP BSC, having its Head Office at Karachi, operates through a network of 16 Field Offices across the country. 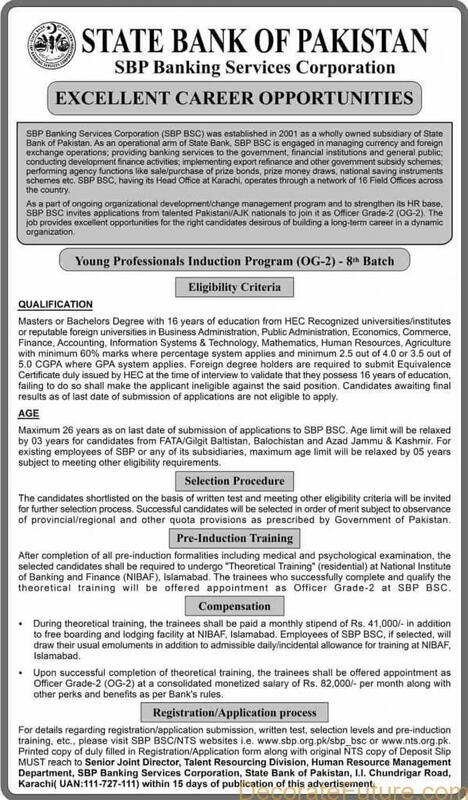 As part of ongoing organizational development/change management program and to strengthen its HR base, SBP BSC invites applications from talented Pakistani/AJK nationals to join it as Officer Grade-2 (OG-2) in Young Professionals Induction Program .The job provides excellent opportunities for the right candidates desirous of building long-term career in a dynamic organization. The Young Professionals Induction Program (YPIP) is one of the starting points of an exciting career at SBP Banking Services Corporation for those who have passion for career development and leadership potential to grow in enthralling technical and managerial roles. It is a unique opportunity for young talent to gain exposure to central banking operations. The program is specifically designed for highly qualified, motivated and dynamic individuals skilled in areas relevant to SBP BSC such as Economics, Finance, Mathematics, Information Systems & Technology, Commerce, Business Administration, Public Administration, Accounting, Human Resources, and Agriculture. We value diversity in our workplace and encourage qualified men and women with diverse academic and cultural backgrounds to apply. Since 2010, the YPIP program has hired around 500 people who are holding positions from entry level to middle management positions. Candidates selected under YPIP are offered a permanent position of Officer Grade-2 at SBP BSC, spend 12 weeks in a structured development program at National Institute of Banking & Finance (NIBAF), and enjoy a variety of benefits and opportunities. Masters or Bachelors Degree with 16 years of education from HEC Recognized universities/institutes or reputable foreign universities in the above fields with minimum 60% marks where percentage system applies and minimum 2.5 out of 4.0 or 3.5 out of 5.0 CGPA where GPA system applies. Foreign degree holders are required to submit Equivalence Certificate duly issued by HEC at the time of interview to validate that they possess 16 years of education, failing to do so shall make the applicant ineligible against the said position. Candidates awaiting final results as of last date of submission of applications are not eligible to apply. Maximum 26 years as of last date of submission of applications to SBP jobs. Candidates are required to appear in a written test, which is conducted by an independent testing agency i.e. M/s. National Testing Service (NTS) on pan-Pakistan Basis. Successful candidates are selected in order of merit subject to observance of provincial/regional and other quota provisions as prescribed by Government of Pakistan. Selected candidates are required to undergo a comprehensive medical fitness and psychological examination. Selected candidates are required to undergo 12-weeks “Theoretical Training” (residential) at National Institute of Banking and Finance (NIBAF), Islamabad. The trainees who successfully complete and qualify the theoretical training are offered appointment as Officer Grade-2 (OG-2) at SBP BSC. The selected officers are required to work in any department/division at Head Office of SBP BSC at Karachi or at any of its 16 Field Offices across the country. The selected officers are placed on probation normally for a period of one year from the date of active service, which may extend to a maximum of two years at the discretion of the Bank. On satisfactory completion of probationary period the selected officers are confirmed in the service of the Bank with effect from the date of completion of probation period subject to verification of documents/certificates (from the concerned issuing authorities) furnished by them at the time of appointment. Upon verification by the Bank, if any statement/information furnished by an officer at any stage is found false or inadequate/incorrect in material respect, or he/she conceals any material information, his/her appointment is terminated immediately without any compensation. In Order To Apply for Young Professionals Induction Program (YPIP) 8th Batch 8, fill the online applications at NTS( Link given below. and pay the deposit fee. The last date to apply for Young Professionals Induction Program (YPIP) 8th Batch is 15-April-2019.